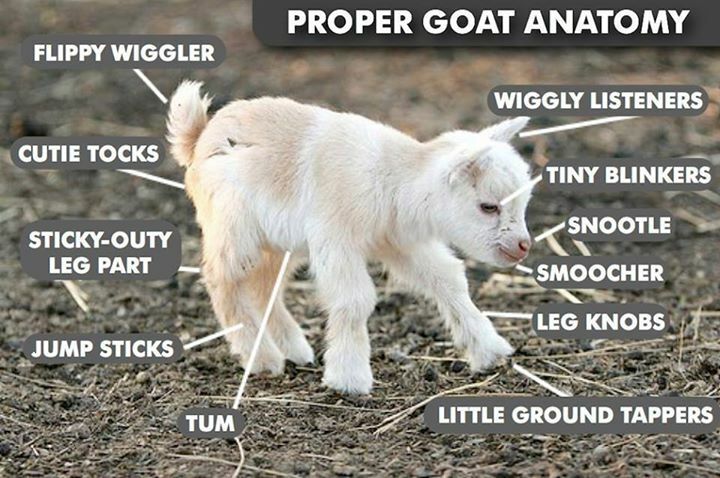 Naturally Proper Goat Anatomy is best described using a baby goat. Why on earth is there a baby goat on this blog? I was informed that goats are cute. Baby goats are cuter. Attractive young women like baby goats. I’m attempting to drive traffic. So we have Goat Tuesday. Every Tuesday, if I can plan far enough ahead, is Goat Tuesday. Given that I did not have my shite together for Memorial Day or D-Day, the odds that I can keep a weekly Cat Monday or Goat Tuesday seem slim. Still, I admit that it is worth a try. At some point though I might attempt to reconcile while Kelly Ripa is in a bikini on this blog but goats are also on this blog. Likely no attempt will be made. One is for one sort of audience and the other of the other.